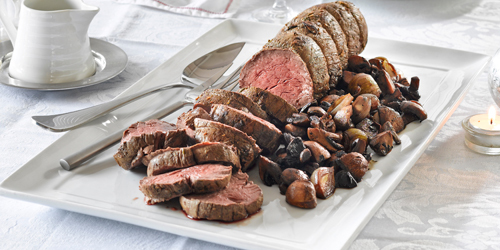 This roast fillet of beef takes less than half an hour to cook, with the sauce easily made while the meat is resting. Follow the simple steps below to prepare and tie the fillet – this can be done well in advance and then kept refrigerated until about an hour before cooking, when you should bring the meat to room temperature before placing in the oven. Serve with your favourite roast vegetables or a pan of creamy scalloped potatoes. Cover and marinate at least half an hour. If marinating in the fridge, remove the meat from the fridge at least an hour before cooking. When ready to cook, remove the meat from the marinade and pat dry. Preheat oven to 230°C. Heat 1 Tbsp oil in a heavy-based frying pan and when very hot sear the fillet 1-2 minutes each side (not the ends) until browned all over. Transfer the meat to a shallow roasting pan, add remaining oil and toss the shallots around the meat, coating lightly in the oil. Roast 20 minutes for rare, or 25 for medium rare. Ten minutes into cooking, add the mushrooms to the roasting pan. Remove the meat, cover and keep warm for 15 minutes before carving. While the meat is resting, place the roasting pan with the shallots and mushrooms on the stove, heat and add the wine, stirring any bits off the bottom. Simmer until reduced by half then add the beef stock and simmer again until reduced by half. Add any meat juices to the sauce and serve the beef in thick slices with the warmed sauce. Eye fillet has a thin membrane called silverskin which needsto be removed if your butcher has not already done so. Use a sharp knife to carefully remove all the membrane. If left on, it will shrink during cooking causing the fillet to curl up. For even cooking and attractive presentation, the meat should be as uniform as possible and tying the joint, called ‘trussing’, is the key. Using individual pieces of kitchen twine, tie the joint firmly at 4-5 cm intervals, spaced evenly between each truss. Tuck the thinner tail of the fillet underneath and tie in place.